Today, the Berlin Global Team had the pleasure of interviewing an influential and experienced diplomat, who is also very accomplished in the field of international relations. Amb. Jorge Cardenas Robles was born in the Plurinational State of Bolivia. His career is as varied as it is interesting. He first graduated with a Bachelor’s Degree in Civil Engineering from the Universidad Mayor de San Andrés, followed then by an MBA in Sustainable Development and Tourism. Since 2002 he has worked as an Independent Sustainable Tourism Consultant. 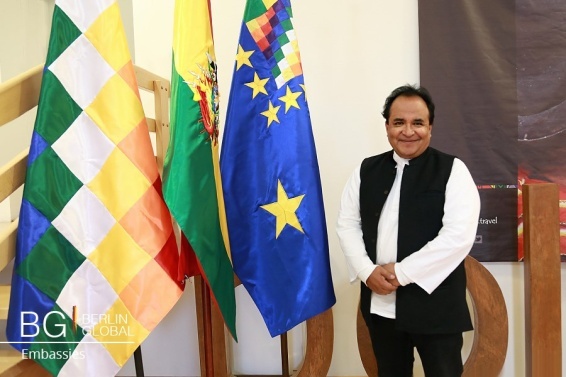 From 2006 until 2012 he worked as a professor for the Universidad Católica San Pablo, and in 2012 he was assigned for the first time as the Ambassador of Bolivia to India. This represented the beginning of an improvement in the economic and cultural relations between the two countries. 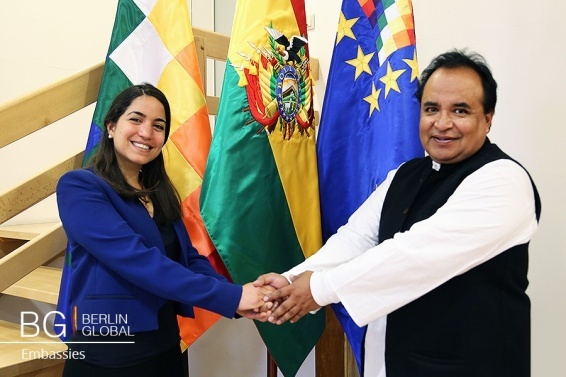 Finally, since April 2016, his Excellency the Ambassador Jorge Cardenas Robles has worked for the Ministry of External Affairs of Bolivia as the Ambassador of Bolivia to Germany. You have recently been assigned to the role of Ambassador of Bolivia to Germany, what are your main goals as a diplomatic? Which aspects do you want to improve the most? Currently, we are looking forward to increase the development of technology in Bolivia and to improve the education system. In terms of technology, Bolivia is already on the right path. For example, a couple of months ago Siemens signed a contract for 1.17 billion dollars. Regarding education and employment, Germany is the country with the lowest unemployment rate and with the highest rate of youth employment. In Bolivia, we are now creating a pilot program that will promote education and, at the same time, will involve the participation of important corporations in order to create a network between them and the students. Germany plays an important role in the project, since they will be our partners and they will collaborate by giving us technological support. It seems to me that Germany has been a positive influence on Bolivia and that Bolivia is learning a great deal from them. Up until recently, Bolivia was attempting to promote and exert Bolivia and its culture. However now our attitude is different, we feel that we are at the same level as other nations. Our philosophy has changed, we now have new partners and we approach and we approach the transnational relations from the same point of view as we approach our day-to-day relations. We are a social country and we appreciate the importance of culture, and we are maintaining or national values when we relate to other states. You had the opportunity to be the first Ambassador of Bolivia to India. In what ways was this role more or less challenging than your current role as an Ambassador to Germany? In India I felt like one of the people. I found out that Bolivia and India have a lot of similarities: Bolivia was colonized and India is now one of the most colonialized countries in the world, so the cultural characteristics of both countries are very similar. However, nowadays Bolivia is no longer a colonized country because we had the opportunity to change this and invest in social inclusion. Regarding Germany, I feel very comfortable here; I am very involved with Germany and the European community in German. Has studying tourism helped you in your role of ambassador? Tourism is also about commerce. But our diplomacy is ‘the diplomacy of the people’, and our preference is to give power to the people who, up until recently may have been at the bottom of society. Our plans include trying to raise and increase the voices of such individuals, women, indigenous people and those who are in general less heard. Has living in a country with 36 different nationalities influenced your point of view on culture? How? Yes. In times gone by these differences amongst different cultures were not accepted, however nowadays they are regarded as bringing more value to society and a nation as a whole. We are taking back our traditions, our language and our philosophy and “living in peace with mother nature”. We have given valuable traditions to society: salsa, merengue, tango, bachata… We should go back to our roots and to our history and respect the important things and in this way we can “live in peace with mother nature." Another point is climate change, for example. It is destroying the world and maybe 2020 is too late. In the way we live, we have this issue on balance. Do you consider cultural diplomacy to be important? Yes and for us it is important to realize that it is more than governments and my role as a politician, it is also an empowerment of the people. We are putting the diplomacy of the people on the world’s agenda. Water, energy, forestry are important issues which relate people and governments together. The same principal as before, “harmony with mother nature" gives us the tools to do it. Do you think Cultural Diplomacy can decrease the differences which exist between countries? Yes, it is a tool which could be extremely useful in terms of breaking down barriers between different cultures. If you break the barriers between the corporations and the people, you will discover that the values of the people are real and the interests are different. The interests of the people are more important than monetary interests. Do you think that could prevent conflict? Yes, because spiritual and cultural values can overcome the economic values and bring people together. Do you think that Evo Morales has made an impact? Do you think he has played an important role in the field of Cultural Diplomacy? Well, he is the first indigenous person to be the president of the Republic, and that's an important symbol. The message is that it is possible, and with his leadership we can move forward with our national principles. Bolivia is a nation with long history and is full of beautiful landscapes. However it is more than just a tourist destination: Bolivia has worked hard to develop an academic research center, which aims to provide opportunities for young German students to discover Bolivia through exchange programs. Have you any opinions on this initiative? In our country we have a different point of view on traditional medicine or community involvement. We can disseminate this point of view and help the western countries to break the chains with technology and show other ways of living. The principal idea is to bring together the strengths of both parts of the world, and combine them in order to make the best of them. How in your role as an ambassador can you help to promote this? Well, for example, in my first week I had a guitar player at the Cervantes institute playing "cuecas para no bailar", and in the Karneval der Kulturen there were more than 150 Bolivians. The concept is different; we are revaluing culture in order to show the world who we are. Finally, what advice would you give to young students who want to pursue a diplomatic career? First of all, travel a lot. Take the best of other cultures and learn from them. This opens your mind and makes you be a better person. I love the tapas in Madrid, or a Brazilian soap operas, I see the opera in London, or also the Karneval der Kulturen... That's the world showing its own taste. We have to share with each other; we have to learn from each other, we have to respect each other. It is not about comparing but sharing, this is what the young people need to know in order to have an open perspective, to find a new diplomacy. In my case, I believe in the Diplomacy of the people. Bolivia is waiting for people to come, we are waiting for interaction, and we need each other. We would love to show our perspective and learn from other perspectives too.